Lately we just cleaned out our garden and there were SO many green tomatoes. There was no reason to let them go to waste though--we simply made a ton of green tomato relish! Despite it's name this is a very versatile food. We eat it with chips like dip, on top of potatoes, beans, and rice like salsa, or on burgers and hot dogs. It's also super easy and quick to make. 3 red bell peppers, halved and seeded (we didn't use these in this batch, but they do add a super nice sweetness to the relish). 3 green bell peppers, halved and seeded. In a grinder or food processor, coarsely grind tomatoes, red bell peppers, green bell peppers, and onions. (You may need to do this in batches.) Line a large colander with cheesecloth, place in sink or in a large bowl, and pour in tomato mixture to drain for 1 hour. In a large, non-aluminum stockpot, combine tomato mixture, salt, sugar, and vinegar. Bring to a boil and simmer over low heat 5 minutes, stirring frequently. Sterilize enough jars and lids to hold relish. Pack relish into sterilized jars, making sure there are no spaces or air pockets. Fill jars all the way to top. Screw on lids. Place a rack in the bottom of a large stockpot and fill halfway with boiling water. Carefully lower jars into pot using a holder. Leave a 2 inch space between jars. Pour in more boiling water if necessary, until tops of jars are covered by 2 inches of water. Bring water to a full boil, then cover and process for 30 minutes. Remove jars from pot and place on cloth-covered or wood surface, several inches apart, until cool. Once cool, press top of each lid with finger, ensuring that seal is tight (lid does not move up or down at all). Makes 12 one-pint jars, or 6 one-quart jars. Relish is good up to one year. ***This is the basic recipe and you can basically build on it from here. 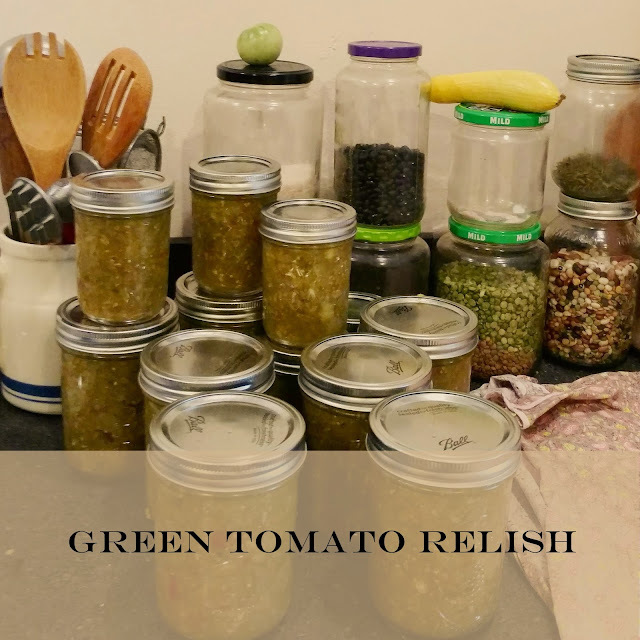 You could add horseradish, celery seed, mustard seed, more onion, more hot peppers, or peaches and make it any flavor you want!